Having a flat, toned abdominal area is something that both women and men desire. Tummy tuck surgery at our Richmond, Virginia practice removes excess skin and fat that is often the result of significant weight loss. It can also address the weakened abdominal muscles many women have after pregnancy. Tummy tuck surgery is appropriate for a wide range of people interested in improving the contour of their abdomens. Using modern tummy tuck techniques, Dr. Lewis customizes the surgery to help restore a cosmetically pleasing contour to the abdominal wall. Pregnancy stretches the skin and the muscular layers of the abdominal wall. Often, after pregnancy, these do not return to their pre-pregnancy state. These changes involve loss of skin elasticity, stretch marks, more prominent fat in the abdominal wall, weakness in the muscular layers, and separation of the muscular layers (rectus diastasis). After significant weight loss, whether through diet and exercise, or undergoing weight loss surgery such as a gastric bypass, people are left with a large amount of excess skin and loose fat. Tummy tucks can often be used to restore a normal contour to the anterior abdominal wall. This can often be done in conjunction with other procedures (lower body lift, breast lift , or circumferential body lift) to assist in the contour of other areas as well. Over time, nearly everyone’s skin loses its elasticity and excess fat accumulates. This can be very problematic to some people and can be addressed with a tummy tuck. This operation allows a careful sculpting of the abdominal wall and can greatly improve the contour and shape. We ensure there are no hidden costs or surprise fees. A tummy tuck is an outpatient procedure that lasts about 3 hours. There are several steps and goals associated with the procedure, which allows Dr. Lewis to address the excess skin, excess fat and weakness in the abdominal wall. This operation is usually done using general anesthesia, providing the most comfort and safety for the procedure. Dr. Lewis begins the operation by making a curved horizontal incision on the lower abdomen. The skin and fat is the lifted off the abdominal wall. This allows the removal of the excess skin and fat from the lower abdomen. He removes most of the skin and fat from below the belly button down to the lower abdomen. The upper abdominal skin is then elevated and brought downward over the belly button and sewed to the remaining lower skin on the lower abdomen. The belly button is then brought to the front and carefully sewed in place. This standard incision used for a tummy tuck is placed in a way so that it is hidden in the contours of the lower abdomen. After lifting the skin off the abdominal wall, the underlying muscles and fascia are visible. 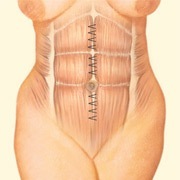 The weakness of the abdominal wall (rectus diastasis) involves a separation of the muscles of the abdominal wall. This is repaired with a very strong, 2-layer closure that dramatically improves the shape of the underlying muscles. The final incision heals well and is well-hidden underneath clothes. The length and amount of curve can vary depending on the amount of skin that needs to be removed and each patient’s individual anatomy. A seemingly minor, but critical, part of the operation is how the belly button is sewed in place. The lower abdominal incision is usually hidden underneath clothes and even under some bikinis. The incision around the belly button is usually the most visible incision after this operation. Dr. Lewis uses an inverted chevron (upside-down V) to inset the belly button. This is a more complicated way to close the belly button, but Dr. Lewis believes it gives the most natural-appearing results. Most tummy tuck patients return home the same day as the procedure, but you do have the option to spend the first night at the medical facility for a nominal additional cost. A medical team closely monitors you overnight. You will have dressings that we recommend leaving in place until the first visit after surgery (usually 2 to 3 days). You will also have 2 drains in place that remove the extra fluid that will otherwise accumulate underneath the skin. These drains decrease the chance of bleeding or fluid collections underneath the skin. They are usually removed about a week after surgery. Although annoying, they are easy to care for and do not stop you from showering after surgery. You may shower after your first postoperative visit. You should not take a bath for a couple of weeks. The first few days at home are very important and patients will be asked to follow post-operative instructions very closely in order to reduce discomfort and prevent any complications. Our abdominoplasty patients are required to walk around the house on the first post-operative day, and activity is increased over time. Surgical garments are worn for up to 3 weeks. We will be available during recovery to answer any questions or concerns and provide medical care when necessary. It does take a few weeks to a few months to feel completely normal. If you are in good physical strength prior to the surgery you likely will have a faster recovery. Many women with jobs that are not terribly physical can return to work in a week, but more physical jobs may require a bit more time. You may drive once you are no longer consistently taking narcotic pain medications; this is usually 4 to 7 days after surgery. You should plan to have someone bring you to your first couple of postoperative appointments. It is important that you start walking the day after surgery, but vigorous exercise should be avoided for 4 to 6 weeks after surgery. The incisions can tend to darken and widen over the first few months. Over the 9 to 12 months following the operation, the incisions will flatten and fade. While the incisions will never completely be invisible, they do decrease greatly with time, and are usually easily covered with clothing and bathing suits. With any surgical procedure there are risks that you must be aware of. To minimize the risks, ensure your surgery is conducted in a safe and secure environment using the latest surgical techniques by checking the certifications and accreditation of your surgeon. Accreditation boards and bodies are there to protect you. Dr. Gordon Lewis has 9 years of surgical experience and is affiliated to several important professional organizations. American Society of Plastic Surgeons (ASPS). Frequently in cosmetic surgery procedures are combined. This can not only help you save money by decreasing associated costs, but also can often create a more balanced result over a larger area. Liposuction is frequently performed as an adjunct procedure. This allows the removal of fatty deposits outside the effective area from a tummy tuck. Liposuction is commonly performed on the flanks (love handles), hips, back, or thighs to help create a smooth contour to the torso. A mommy makeover is a combination of procedures that is frequently performed on women after they are done having children. Many women would like to complement their belly procedure with an improvement to their breasts. This can be a breast lift (mastopexy), breast augmentation , or a combination of the two. With these combinations of procedures, many women can restore their body to a near pre-pregnancy state. He also has privileges at St. Mary’s Hospital and Henrico Doctors Hospital, but operates there less frequently. Initial consultations, follow up appointments and all non-surgical treatments and minor surgical procedures are performed at Lewis Plastic Surgery practice which is located on the grounds of the Johnston-Willis Hospital, Richmond, VA. If you’re looking for a plastic surgeon in the Richmond area to perform tummy tuck surgery (abdominoplasty), request a consultation using the online form to meet with Dr. Gordon Lewis. Or call our office at (804) 267-6009 to schedule an appointment.